Plan a Ski Movie, and See it Snow! While waiting for our Jackson screening of Warren Miller’s “Wintervention” to begin, I went shopping in downtown Jackson. If you’re there, do NOT miss MADE, in Gaslight Alley! I bought a really fun and funky glass ring for $15. Seriously. John, the owner, makes beautiful works of glass art, including Steamboat belt buckles! They are COOL! As always, I enjoyed my time shopping in Jackson — the shopping is where the West meets New York. Always a treat for me! Our movie screening was decent — the JH High School was very accomodating, and the ski coach, Cody Hansen, was a great help. We had a modest crowd, but it’s a good start to our work there. We’ll be there next year and will look to grow on what we started! I stayed in the most ADORABLE inn. The Inn on the Creek. Oh my GOSH is all I can say! This inn combines a handful of comfortable yet luxurious rooms that are contained within a quaint stone cottage that overlooks ‘the creek’. My room was the Goldeneye, with a jacuzzi tab and gas fireplace in my bedroom, complete with votive candles! I felt a little guilty about being there by myself — but the jacuzzi tub soak and a good book helped ease that guilt slightly. 🙂 Breakfast was served to my door right on the nose, with my specifications made when I checked in. The staff was so gracious and friendly, and I will definitely put this on my list of repeats. Bravo!!!!! I hit the road on Saturday morning and headed to Cody by way of Dubois, Riverton, Shoshoni and Thermopolis. My Road Warrior status was challenged slightly as snow was falling on a slick road over Togwotee Pass. The beautiful scenery welcomed me to Dubois, and I was excited to see that the Capitol Christmas Tree Celebration was taking place! I enjoyed meeting members of the tree committee as well as an online friend from the area! It was a fun, short stop! The rest of my trip was uneventful, and I always love traveling through the Wind River Canyon. What a town Cody is! I had a great time. My hosts highly recommended Cassie’s for supper and brunch Sunday morning, and they were absolutely spot on. I recommend the rotisserie chicken, which was HUGE! For brunch, I had the cream cheese stuffed french toast with berries and whipped creme…it was absolutely enormous and decadent! The Bloody Marys are known as some of the best in town. The atmosphere is very cozy, and the history just oozes from the walls. The staff is friendly and very knowledgeable about the menu. The manager is always greeting guests and making sure everyone is well cared for. When I arrived, I was greeted by probably half a dozen employees! The live music was a nice touch for my Saturday night visit, and I can imagine how much fun one can have on their dance floor! Sunday morning pre-brunch I enjoyed the Buffalo Bill Historical Center. What a gem! I could go on and on about all that I loved…the historical models, the displays, the William Cody antiques and family memorabilia, the Plains Indians exhibit, the Yellowstone displays…just outstanding. Definitely one not to miss! Post-brunch, I took a drive up to the Buffalo Bill Dam (BEAUTIFUL!!!) and stopped in to see the Irma Hotel. Another historical gem not to be missed — built by William Cody and named for his daughter, the hotel celebrated its centennial in 2002. I also had only a moment to explore downtown shops before the Capitol Christmas Tree arrived in Cody, so I popped into Reindeer Ranch on Sheridan Ave. WOW!!! The beautiful Christmas decorations were jaw-dropping. The store is a mixture of historical components and fun holiday decorations. I could have spent a LOT of time in that store! I felt very privileged to experience the arrival of the tree in Cody. The turn-out was impressive, and the excitement was electric! It was fun to be a part of that energy, even if it was for a brief moment — we had some movies to put on! 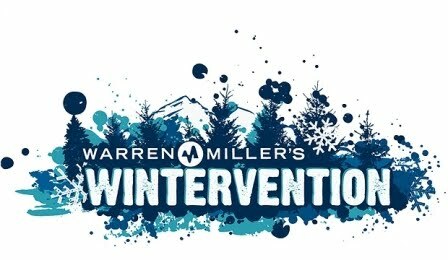 Our two screenings of Warren Miller’s “Wintervention” in Cody went over VERY well! The Sleeping Giant Ski Area staff were great at connecting with the public, and the attendees were very supportive of the resort. We had a great turn-out, people had fun, and it was a real joy working with the staff. Tony and the staff of Big Horn Cinema were AWESOME, and extremely accommodating! I’m excited to go back next year! The drive home was slow, with snow the entire way from Cody to Laramie. Levi waited up for me as always to get home, and we rolled into bed at 3 AM — but it was worth it, it was a GREAT weekend! Til next time — I’m logging the miles and excited to see where the adventure takes us next!